Thanks Michael Pollan for this depressing view of our nations vegetable supply chain, from the Sunday New York Times, The Vegetable-Industrial Complex. 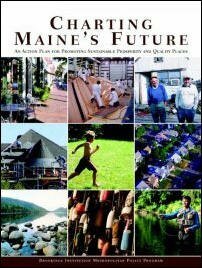 Yet more reasons to buy locally, or grow your own! A work pal and I have been speculating about putting together a group to buy locally raised meat, time to kick that effort into high gear. 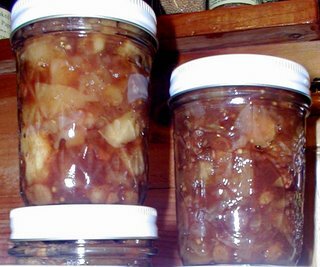 With the apples left over from our apple tasting party, I decided to make chutney. There's nothing better on a cold February day than a grilled cheese and chutney sandwich, with dilly beans on the side --yum. Combine brown sugar and vinegar in a large saucepan and bring to a boil. 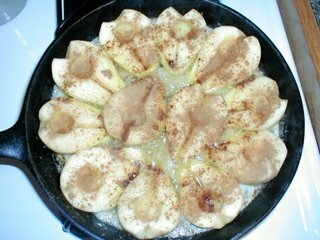 Add the pears and remaining ingredients. Cook over low heat, stirring occasionally, until the mixture thickens (+/- 1 hour). Ladle into hot, sterilized jars and seal. Process in a boiling water bath canner for 10 minutes. For this batch, I used a mix of Clapp's Favorite pears, Newtown Pippins, Stayman's Winesap and Wolf River apples. In a few days I'll taste and file a report. It sure smelled wonderful! 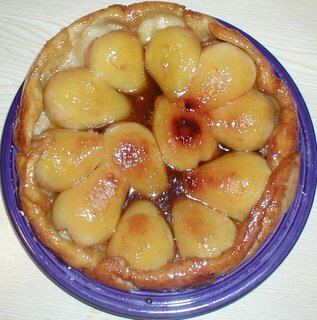 We generally agreed on these -- Pumpkin Sweet was all good looks and nothing special under the skin, Newtown Pippin inherited none of its famous cousin Cox's goodness, Stayman's Winesap could be consumed if desperate, Winesap was good but with an astringent finish, Rome was all sweetness up front but with no staying power. On biting into a Fameuse or Snow apple, we agreed there was a lively sweetness, but it faded to nothing in moments, and the flesh was soft -- this could be becasue it isn't a good keeper, so it may be worth seeking out next fall. Our three favorites: Spencer, Connell Red, and Honeycrisp, with Spencer the clear favorite and the group split over Honeycrisp and Connell Red. Still to be tasted: Northern Spy, Cox's Orange Pippin, Gravenstein, Spitzenburg, Calville Blanc d'Hiver, and Wealthy. And any others that look interesting the next time I'm at the orchard. 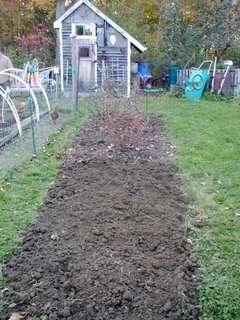 We worked on the blueberry hedge today, turning over the second half and adding 40 lbs. of gypsum, to help lighten the clay soil, and a mix of Espoma Holly-Tone fertilizer for acid loving plants, and Garden sulpher, to acidify the soil a bit -- currently the pH is 6.5, and blueberries need a pH of 4.5 to 5.0 for best performance. 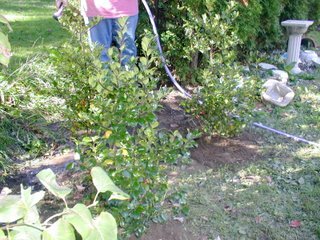 The completed hedge will be 4'x25' and hold 16 highbush blueberry plants. We currently have 7 in place, 2 each of Patriot and Blueray, and 3 unknown varities that came with the house. We also worked a bit on a new bed we are planning for the spring as part of our continuing efforts at lawn reduction. This bed will run from the freestanding deck to the driveway, along the western border of the lot. 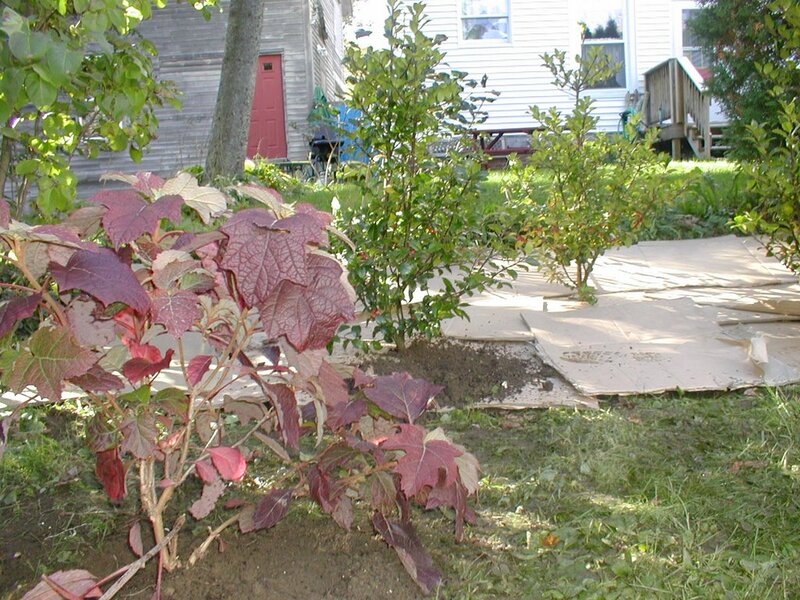 Last week we added three hollies and an oakleaf hydrangea to the back border of the bed. Today we mulched with a thick layer of cardboard, and put some sandy soil (left from an earlier project) atop the cardboard to weight it down. 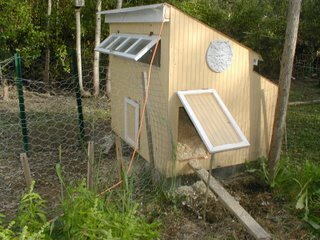 I'll add a thick layer of mulch hay and some Fertrell organic fertilizer soon --we hope to pick up some mulch hay Sunday morning. 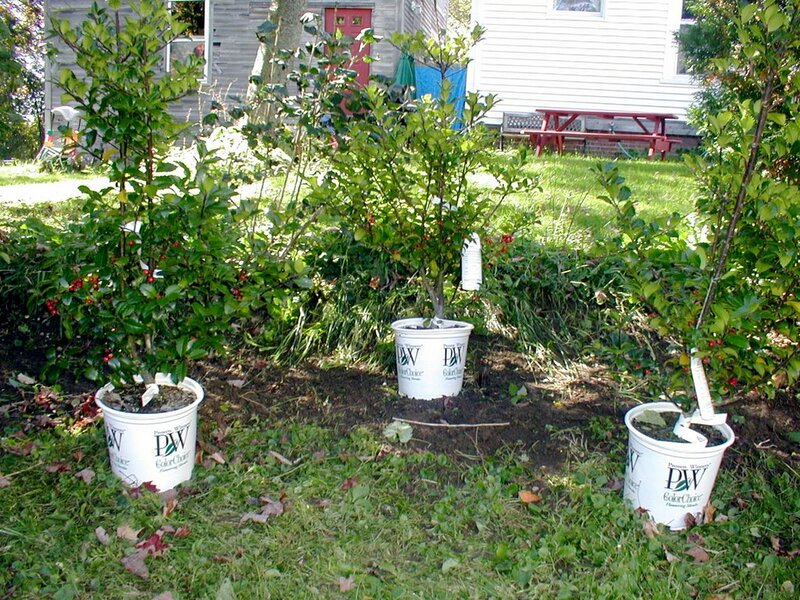 The other very satisfying project we are working on is preparing for more fruit trees in the backyard. I have a Stella sweet cherry and a Montmorency sour cherry, planted 4 years ago. 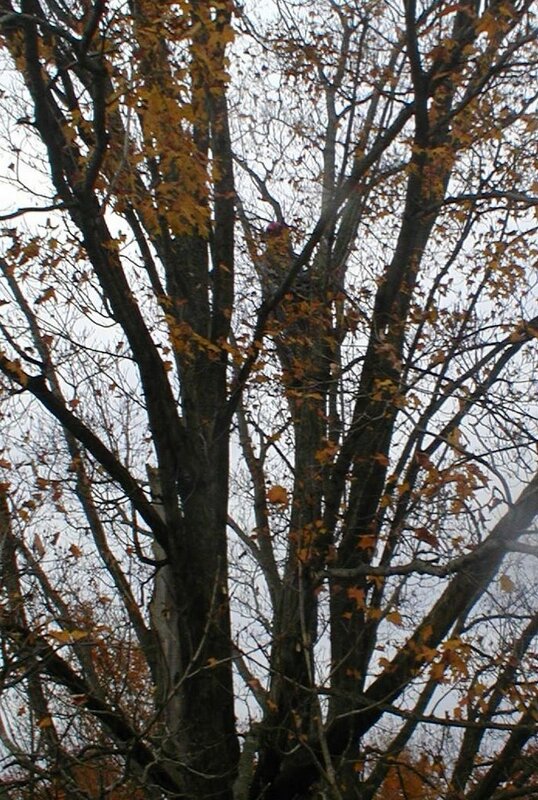 They flowered wanly this spring, but clearly resented the cold wet spring, and I got no fruit from either tree. Today we plotted the planting sites for an additional 7 trees, a mix of peaches, apples, and plums. I'll add a pear tree next to our existing unknown variety of pear in a different area. Now the hard part-- how to pick just 2 or three of each fruit?!! We'll get started on the apple question Sunday with a tasting party in the afternoon. We be tasting 7 varieties, Pumpkin Sweet, Winesap, Wolf River, Connell Red, Newtown Pippin, Spencer, Rome, Stayman's Winesap, and Honeycrisp from Pleasant Pond Orchard. Check back later for the complete report. When I was a kid, I remember poring over the Sears wishbook in the weeks before Christmas. These days, my wishbook is the FEDCO Tree catalogue, and it arrived in the mail last Friday. Who could resist this text? Black Oxford Apple Winter. Unknown parentage. Paris, Oxford County, ME, about 1790. 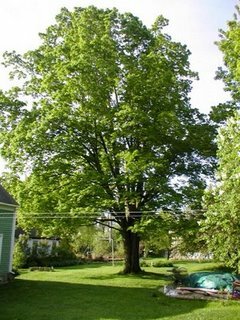 This outstanding apple, a favorite long ago around much of Maine, has been making a huge comeback in the last 20 years. Our best seller. Medium-sized round fruit, deep purple with a blackish bloom. From a distance you might think you’d discovered a huge plum tree. 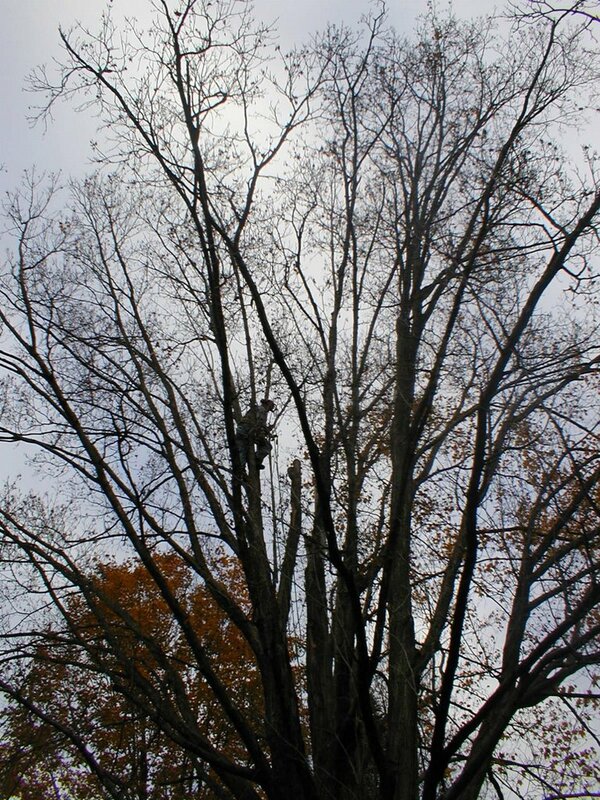 A 200-year-old Black Oxford tree still grows in Hallowell, and still bears large crops. Excellent pies, superb late cider. Leave the skins on for a delightful pink sauce. Best eating late December to March. They seem to get sweeter and sweeter as the months go by. Good cooking until early summer. Some insect and disease resistance. Becoming less rare every year! Blooms late. Z4-5. ME Grown. The problem, of course, is that I cannot. I want one of everything. So over the winter, as I warm my feet by the woodstove, I will thumb through the catalogue again and again, and sort out what I can't live without, and what I can. As we were eating breakfast this morning, Dan asked, "Did you turn the heat on?" "No, why?" I replied, dreamily looking out the window into the sunny back yard, planning my day over my coffee. "Do you hear that clicking noise?" he said. 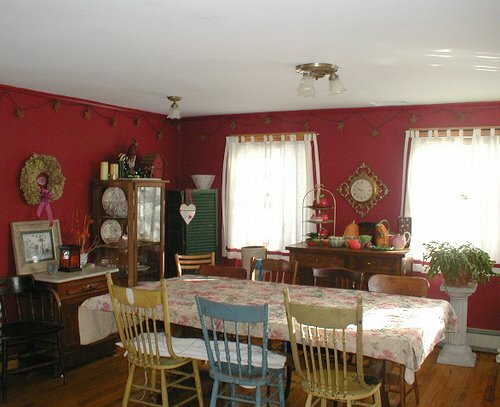 As I listened, Dan leaped to his feet and ran into the dining room. "It's dripping!" he shouted, running up the stairs to our bedroom. "The bathroom is leaking!" It was just 8:30 a.m.
Sure enough, in the bath off our bedroom, the hot water pipe under the sink had split, (no, we don't know why) and while we made coffee and toasted bread, it soaked the rag rug on the floor, and seeped through the bathroom floorboards and drywall ceiling of the dining room below. 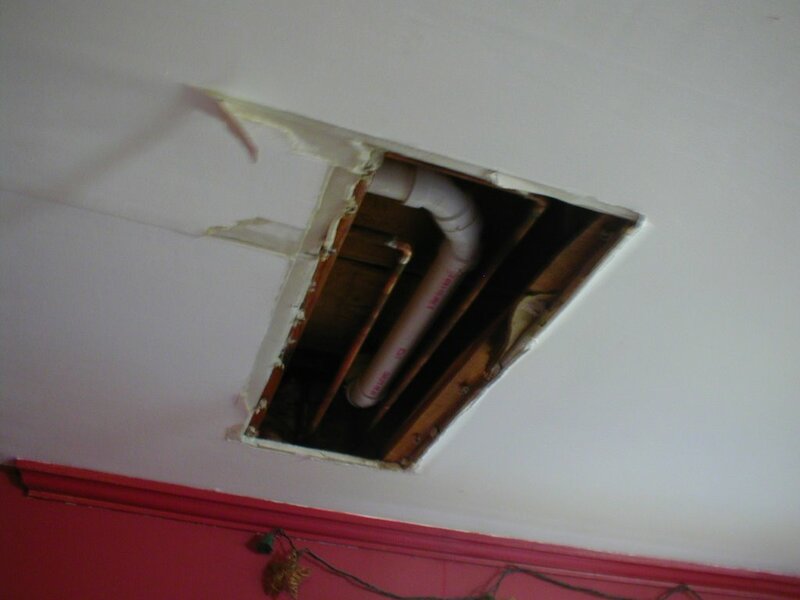 Our lovely dining room now has a large hole in the ceiling where we pulled away the drywall to let the water out, and the water to the bathroom sink is shut off until we repair the leak. It's a good thing I hadn't gotten around to putting the new package of t.p. away under the sink. 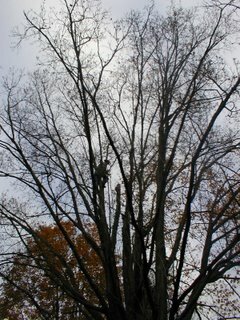 Today was a gorgeous fall day, with clear skies, no wind to speak of, and mild temperatures after a cold night. We went yard saleing in Brunswick this morning, hoping to come home with one of two bandsaws advertised in the yard sale classifieds, but alas, the saws were sold before we arrived. I did find some baguette pans, and we found a nice 6 lb. sledgehammer which will be very useful. On the way home we stopped at Skillins where we bought 80 lbs. of gypsum to add to the vegetable garden to help lighten our heavy soil, and some Holly Tone organic fertilizer for our acid-loving plants. While we were there, we took a gander at the trees and shrubs, all on sale. 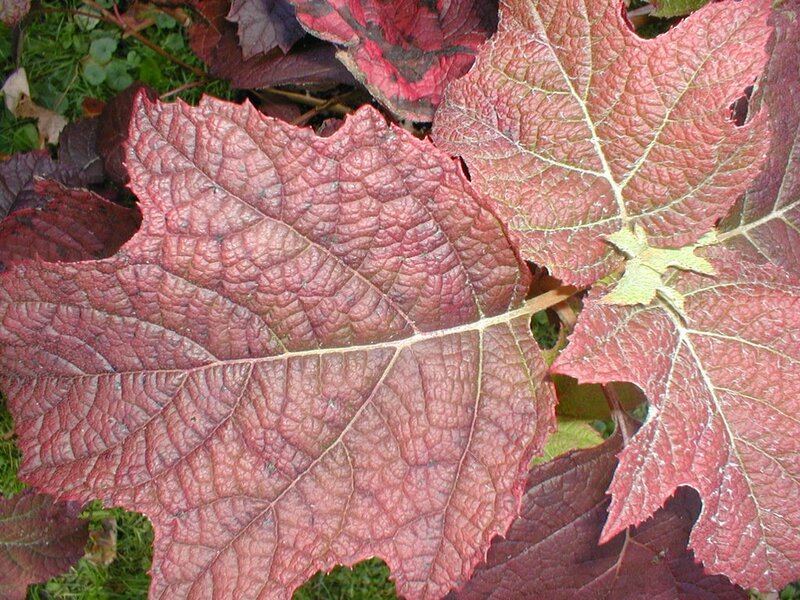 I found an oakleaf hydrangea cv. Alice, which I snapped up at 30% off. It has large roughly oak-shaped leaves, and in the fall, turns a gorgeous deep red. 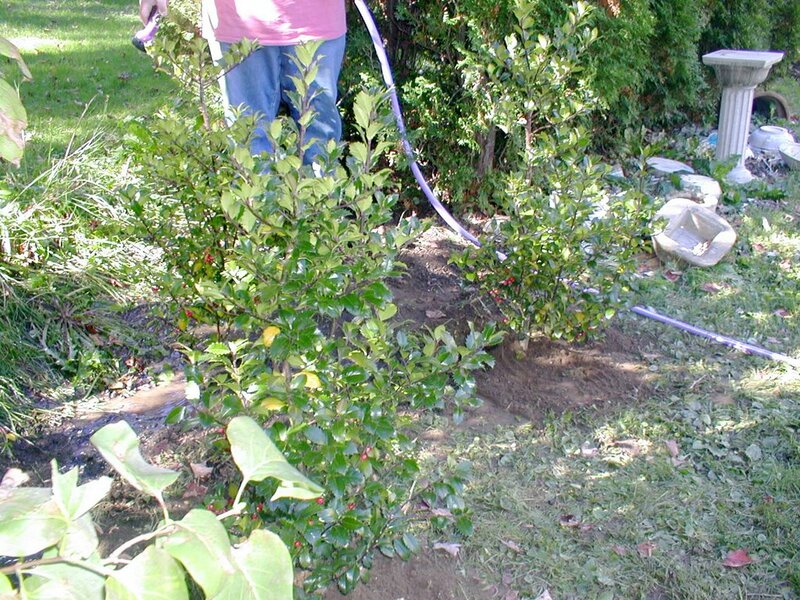 I was hoping to find some holly bushes for the gap between the arborvitae and the lilac hedges. We saw some Blue Princess and Blue Prince holly bushes, but they just didn't speak to me. Then I saw three Castle Spire female hollies, covered with berries. Where the Blue Princess spread to 6-8 feet wide, 8-10 feet high, and had glossy dark blue- green leaves, the Castle Spire holly is narrower, only 3-4 ft wide, and up to 10 feet high, with shiny dark green leaves. At that size, thy seemed just the ticket for filling the gap, and they two were 30% off. We bought all three, knowing that we will need to add another male holly. As we set them in place, we decided we need two more, a male and a fourth female, to fill out the hedge and form a nice backdrop for the garden bed we have planned in front of them. 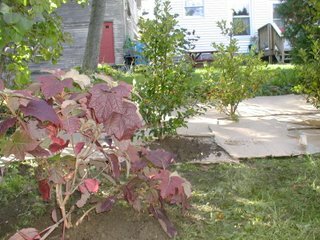 We planted the hollies and the hydrangea after lunch, amending the soil with compost and some Holly Tone fertilizer, watering them well, and mulching with a thick layer of cardboard. 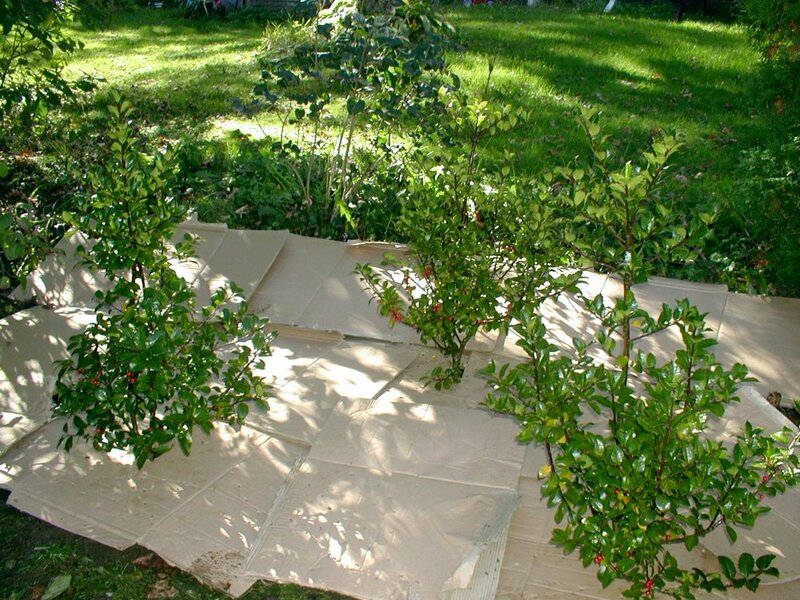 We will wrap each plant in floating row cover fabric to protect them from the wind, cover the cardboard with hay and compost, and by spring, the grass will be dead, the worms abundant, and I hope, our new plants will be very happy. And I'm happy too, after all, when your best friend is named Holly, you certainly should have her in your yard! 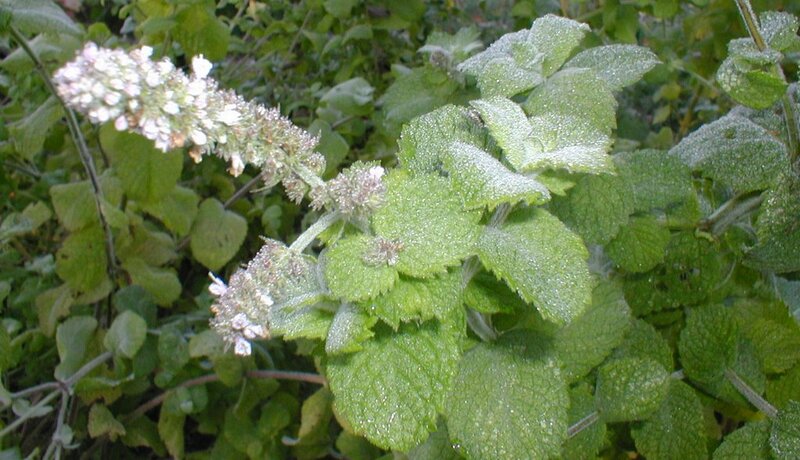 We had our first hard frost last night. When I came downstairs this morning, and checked the thermometer on the barn, it read 35˚F, brrr. 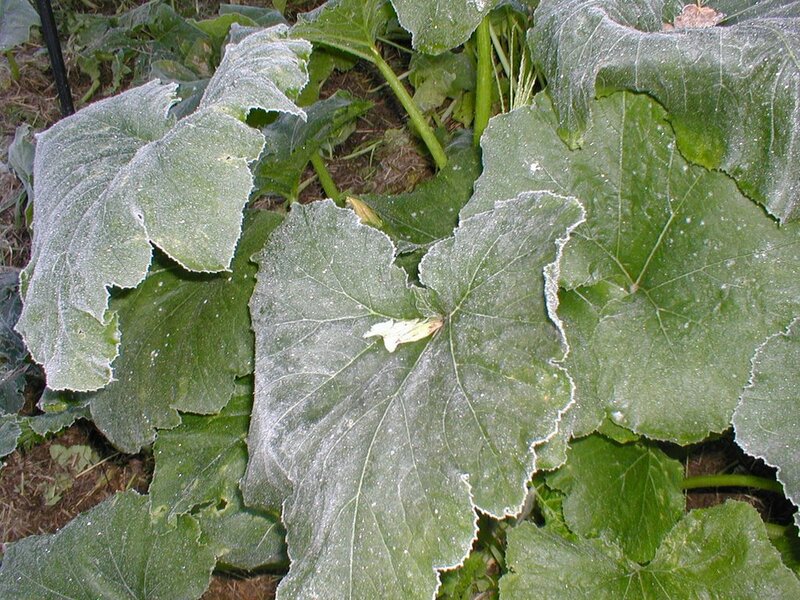 The leaves were coated with rime, and on the squash, already beginning to droop. I hope we can still harvest the 2-3 remaining baby squashes for dinner tonight. We brought in some of our planters last night, the rosemary topiaries, the hens and chicks, the parsley, and covered the scented geraniums with old tablecloths. 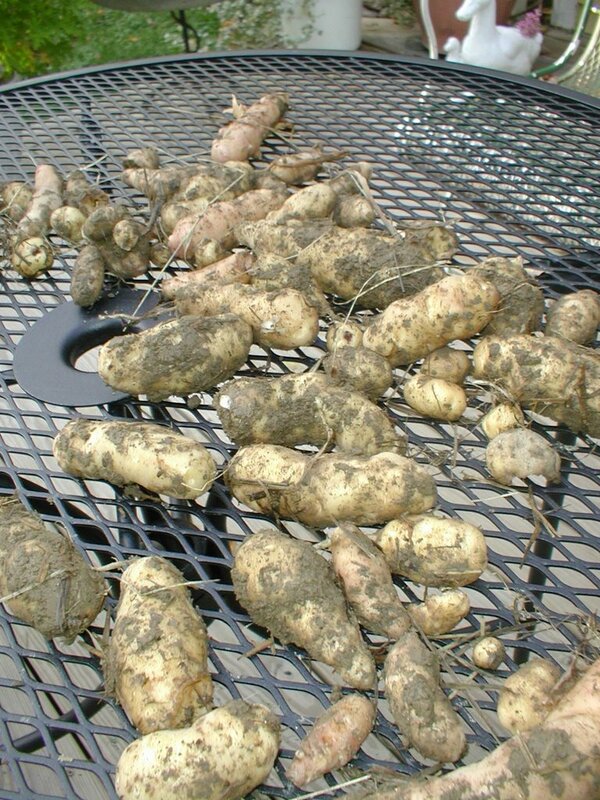 Over the weekend, we'll have to cut them back and prepare them to come inside for the winter. The temperature in the kitchen this morning was a nippy 57˚F, so I turned the furnace on for the first time this fall. 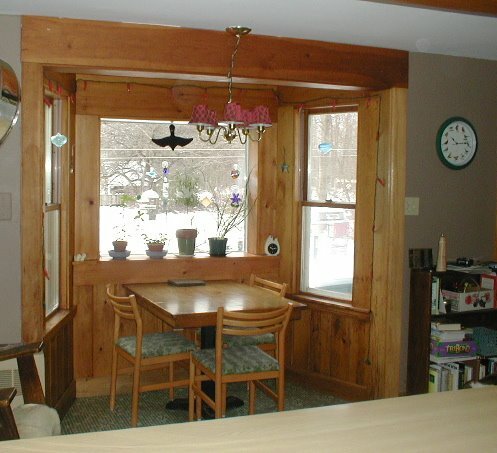 We don't have the storm windows on yet, so we'll need to take care of that little chore as well this weekend. We still have leeks and cauliflower in the garden, and sproutless Brussels sprout plants which I suspect won't be providing sprouts this year. The leeks and cauliflower will last a bit longer -- we'll eat the cauliflower, and store the leeks for use through the early fall. The rest of the garden we let go -- there were a few small yellow pear tomatoes remaining on the vine, which we left to the chickens. Iris cleverly developed a method for harvesting the tomatoes beyond her reach. Climbing onto a stack of three bricks left next to the raised bed, she leaped straight up into the air and pecked at the tomatoes until they fell from the vine. She unwillingly shared a few with her sisters, but she certainly enjoyed plenty herself. The girls were rather subdued for a few days after Daisy's death, but seem to be returning to their former high spirits, bolting out of the coop in the morning when I open the door, raucously demanding their customary handful of scratch. They are doing a great job of cleaning up in the garden. Once we pull the remaining dead plants, I am sure they will clean up the remaining bugs, larvae, and I hope, some of the weed seeds quite nicely as well as stirring up the top layer of soil and adding some fertilizer. 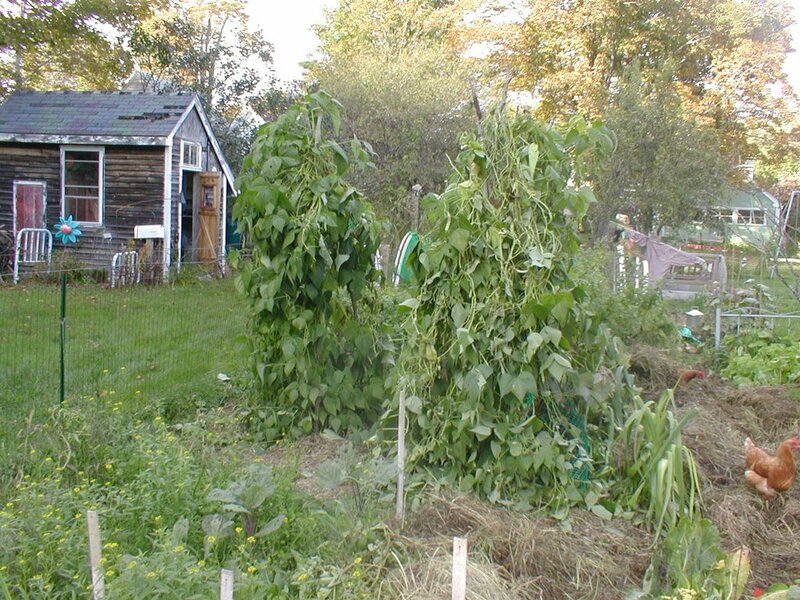 I am looking forward to putting the vegetable garden to bed, and starting work on the new garden design. 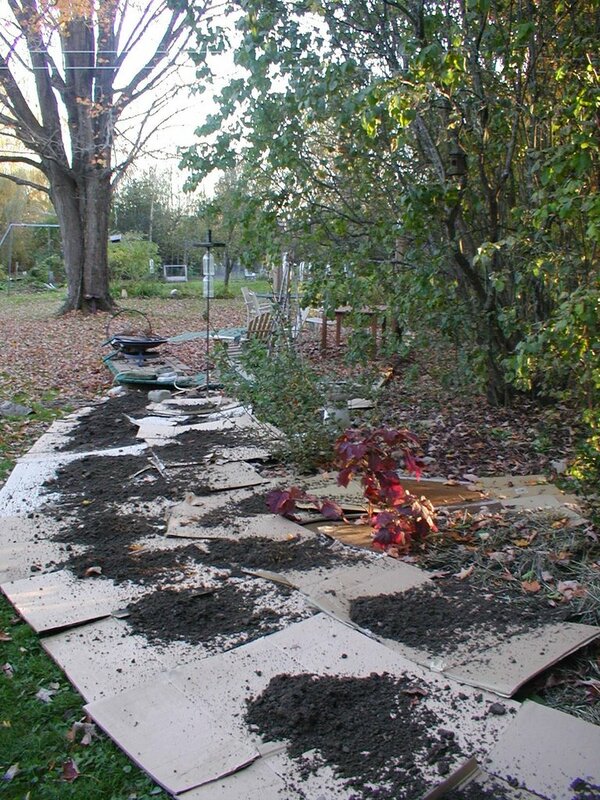 We plan to create raised beds in a U shape, following the perimeter of the garden fence. 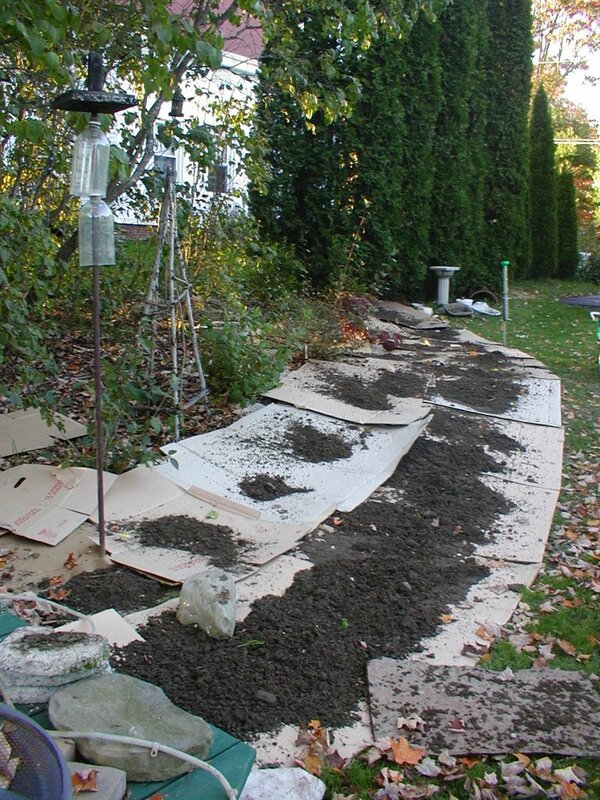 We'll dig out a path around the beds, adding that soil to the beds to raise them a bit. The center section of the U will be reserved for herbs, and the outside section will hold the remaining vegetables, with the climbing veggies strategically placed next to the fence. We are going to adopt more of a "square foot" bed plan, with intensely planted beds and narrow pathways between them for access. I need to draw up the plan on graph paper to get a to-scale sense of how it will work, but my back of an envelope calculations indicate it will work just fine. Yesterday, our chicken Daisy died. We noticed on Sunday afternoon she was not feeling well; she was standing in the vegetable garden, feathers all fluffed, and sleeping. We brought her in the shed, and put her in a plastic bin with shavings, and did some research. We think she had an impacted crop, possibly from eating some apple peels I gave the chickens on Friday evening. According to one chicken website, long strands of grass or apple peels can become impacted in the crop. 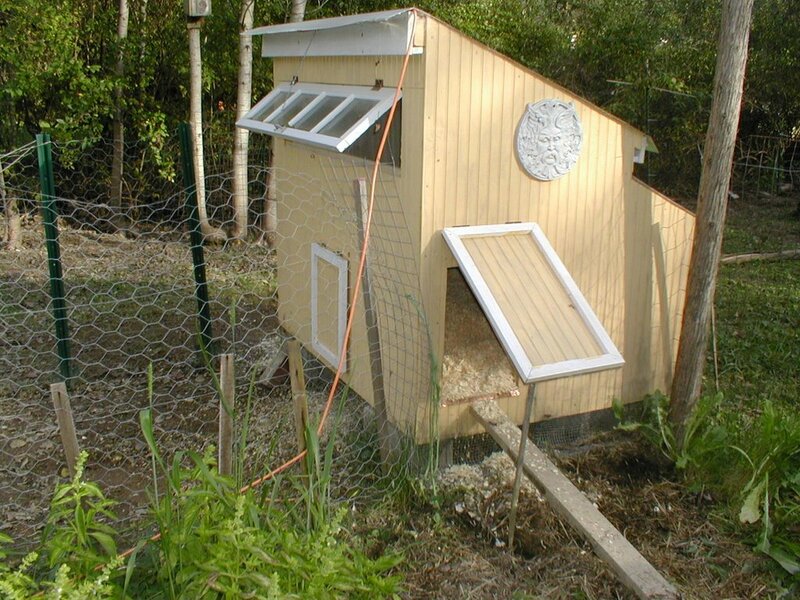 Some chickens are able to recover on their own. We got yogurt, one remedy we read about, but to no avail. I feel very bad about it, especially as I was the one who gave the girls the apple peels. Poor Daisy, I can only hope she didn't have too much pain or suffer much. Saturday, we began the process of putting the vegetable garden to bed. 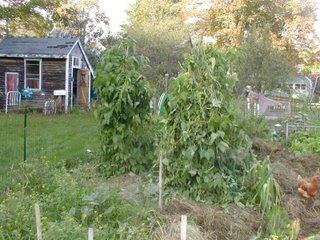 We have yet to have a frost, but we've had two pretty cold nights, cold enough to nip some of the leaves of the tomato, bean and squash plants. 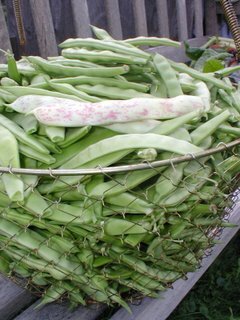 We picked a heap of beans a few weeks ago, freezing some and putting up two batches of dilly beans, one of my favorites. 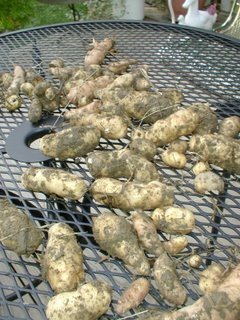 After Friday night's brush with frost, it was time to pick the remaining beans, dig the potatoes, and harvest any other remaining vegetables. 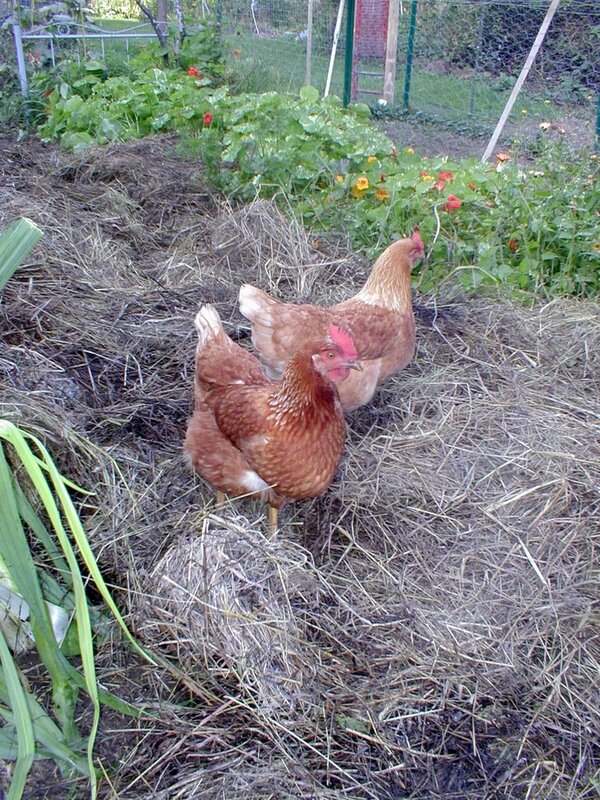 We also decided that with the end of the garden, it was time to let the chickens have the run of the vegetable garden, and to re-seed their run with grass and let it rest. First, we harvested all the Swiss Chard -- that could have stayed for a whil e longer, but was in the way of the alternate door of Henbogle coop. It was gorgeous, one of the garden successes this year. 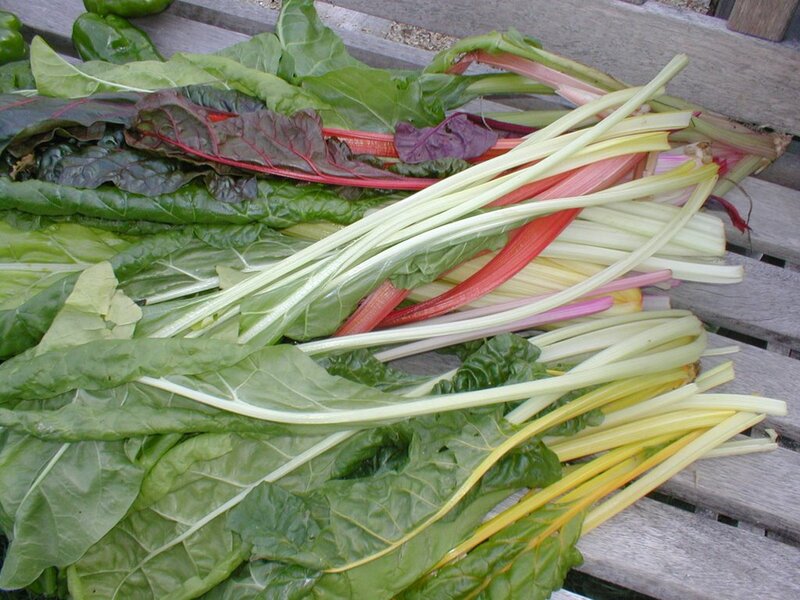 We grew the Rainbow Lights variety, and it really is beautiful, with a nice, mild flavor. 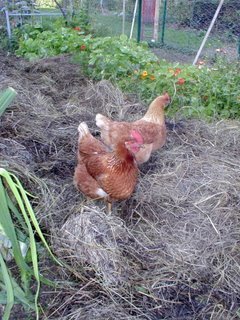 With the chard gone, we let the chickens in the garden. They were ecstatic, exploring under the bean tepees, patrolling the remaining cauliflower for any errant bugs, and when I dug the potatoes -- well, they were right there eating any bug that came to light. I had all I could do to avoid digging up a chicken. Entertaining the girls was the best part of the potato harvest this year. 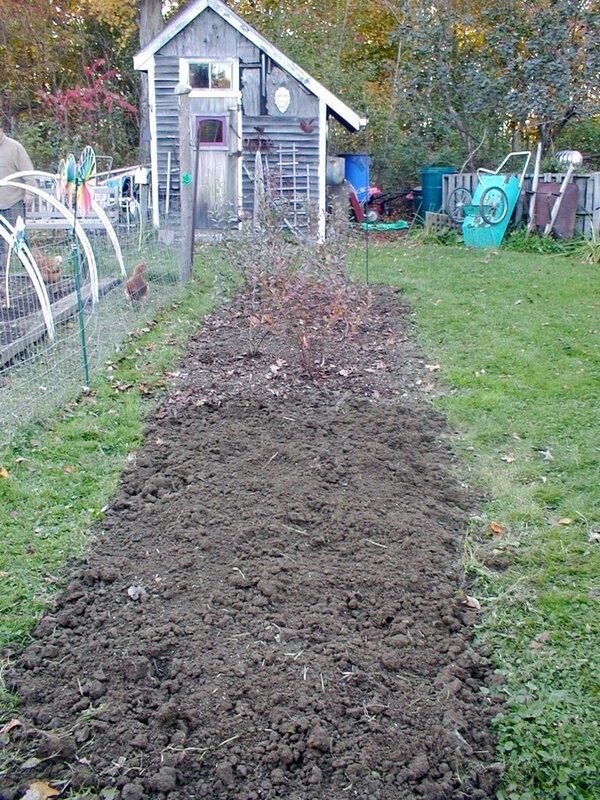 I planted 4 types of potatoes, Finn, Carola, Rose Gold, and LaRatte. The Finns and Carolas were a total washout, the very rainy June just turned them into mush. I planted the Rose Gold and LaRatte later, and we did harvest some, but not many, sigh. We harvested enough for 4-5 meals. It was just too wet for them to thrive, although the tops looked good. Our new garden plan will include lots of clay-breaking soil amendments this fall, and raised beds in an attempt to keep the feet dry of our vegetables. We had a good crop of green peppers, unfortunately all ready now, rather than 1-2 a week beginning a month ago. Still, we'll eat them and enjoy. 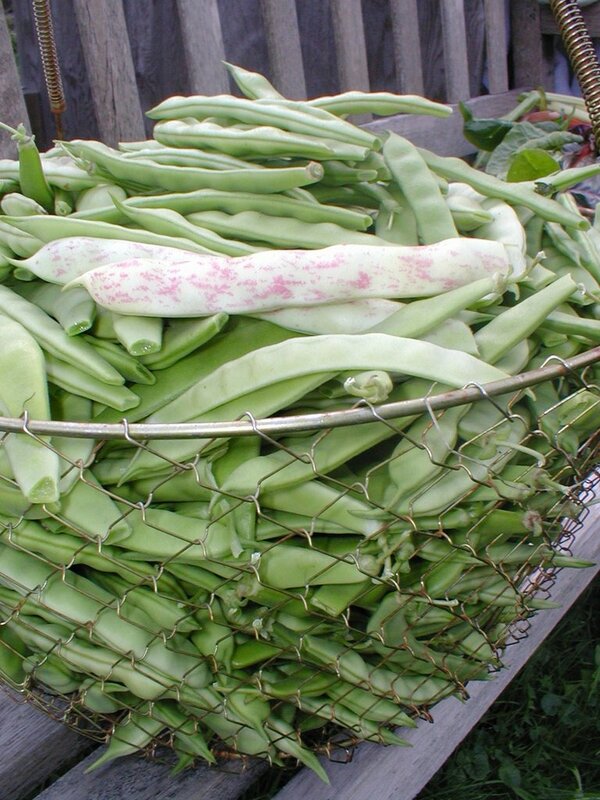 And the beans, oh, the beans, We picked a huge basketfull, and if the plants don't get hit again with a frost, we may get more still. We had a huge feast Saturday night, with scallops from the freezer (to make room), beans and freshly dug potatoes. MMMMMMM!